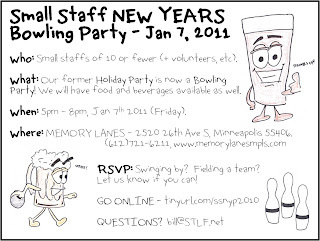 Minnesota Rising: Small Staff NEW YEARS Bowling Party! 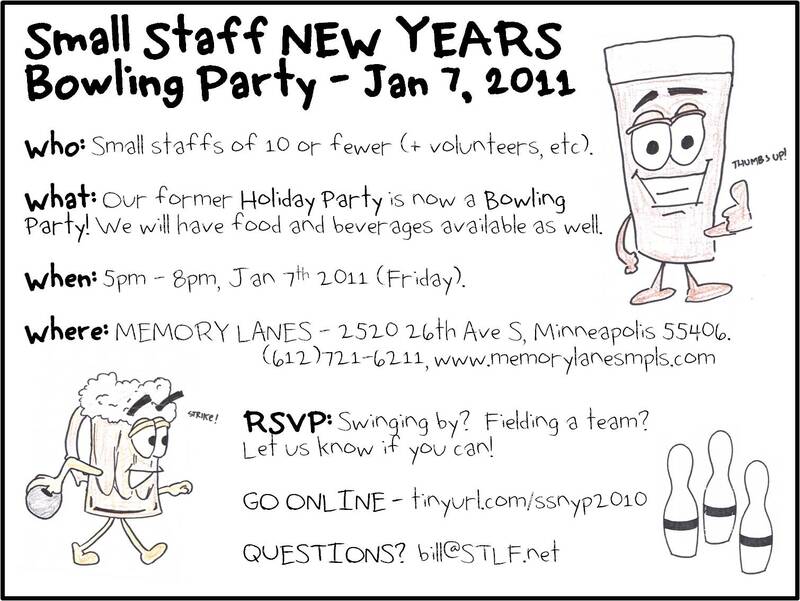 Small Staff NEW YEARS Bowling Party! Are you a member of a small staff? Is your office a bit too tiny for its own holiday blowout? Here's your chance to join up with other small groups of good folks doing great work. This time, though, the objective is fun and festivities! See below for the holiday event invitation and details from Bill Breon at Students Today Leaders Forever (STLF). Small staff events are a time for the collective small staffs to unite in conversation and fun. Since Nov and Dec are packed with awesome events, our former HOLIDAY PARTY is now a NEW YEARS BOWLING PARTY! PLEASE share this party with your friends! Who: Small staffs of 10 or fewer (+ volunteers, etc). What: Bowling, food, and beverages. When: 5pm - 8pm, Jan 7th 2011 (Friday). Whether you are swinging by or fielding a team, please RSVP if able by visiting: tinyurl.com/ssnyp2010. If you have any questions, please contact Bill at STLF. 10 Best Minnesota Rising Posts of 2010! The gift is nothing without the work. Be a Youth Venture "Arts to Venture" Advisor!